Friday September 25 was a truly memorable day for African development. 193 world leaders united at the UN Sustainable Development Summit to adopt the Global Goals, a highly ambitious 15-year, 17-point agenda that aims to eradicate extreme poverty, secure global food security, and combat climate change. Also known as the Sustainable Development Goals, the Global Goals replace the Millennium Development Goals (MDGs), which have shaped the development landscape for the past 15 years and expire in 2015. I believe that the Global Goals mark a significant, positive departure from the MDGs. Where the traditional North-to-South direction of the global development partnership was embedded in the MDGs, the Global Goals apply equally to all countries. Furthermore, the new goals recognise the private sector as a key driver of development, while their predecessors largely ignored businesses. The Global Goals also focus on building productive capacity and prioritise economic and environment factors, which makes them especially relevant to African countries seeking to become dynamic, knowledge-based economies. And while all the goals are valuable, Global Goal 9, which seeks to build resilient infrastructure, promote inclusive and sustainable industrialisation and foster innovation, is especially important. The continent has undergone rapid changes in the last decade, fuelling demand for infrastructure services including energy, transportation, and ICT. The reality of climate change also means even greater shifts in our social, economic and physical environments, which infrastructure will have to adapt to. In addition, industrialisation is a critical engine of economic growth and development that promises to promote economic diversification, efficient use of the continent’s array of human and physical resources, and eliminate poverty. In this way, UNECA argues that it can help address Africa’s paradox of high unemployment and poverty co-existing along sustained high economic growth. Yet the goal also recognises that rapid industrialisation needs to be mindful of future generations’ needs. Third, innovation can help enhance economic competitiveness and ensure that the continent is able to address and resolve its own development challenges. However, the successful implementation of these three crucial drivers for Africa’s development is contingent on what H.E. Dr. Nkosazana Dlamini-Zuma, chairperson of the African Union, calls ‘a skills revolution, especially in sciences, technology, and innovation’. In other words, we need to take decisive action to equip our next generations with high-level scientific and technical competences. As the biggest source of job creation and an engine of growth, the private sector is well positioned to help African countries invest in the capacity building and skills development needed to achieve Global Goal 9. 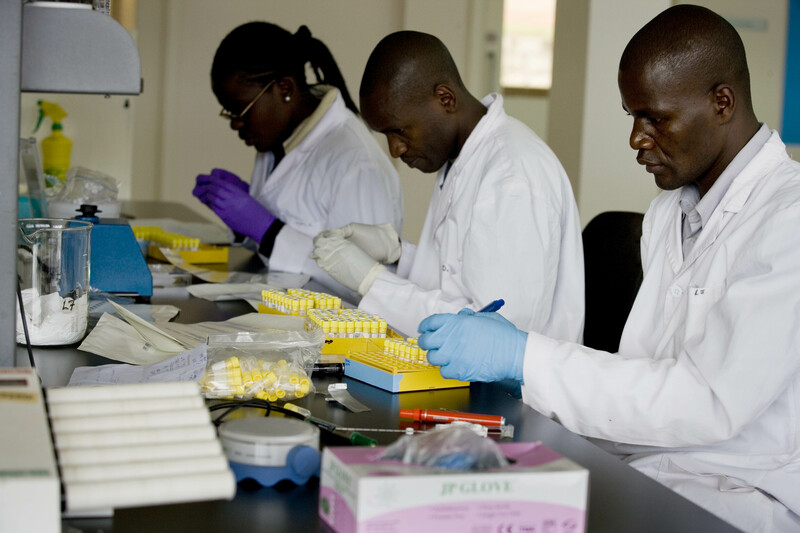 First, for-profit businesses can help strengthen scientific research by providing funding for talented scientists and researchers to pursue postgraduate training in African universities. For example, the Africa Business Champions for Science, a group of influential figures from industry with a passion for STI on the continent that I chair, is contributing to the Regional Scholarship and Innovation Fund with the Governments of Senegal, Ethiopia and Rwanda. The Fund will contribute to the World Bank’s Partnership for Skills in Applied Sciences, Engineering and Technology (PASET) programme, which seeks to award 10,000 African PhD scholarship over ten years, to strengthen research and innovation in applied science, engineering and technology. These kinds of initiatives are not about gifting. Rather, they are beneficial for all stakeholders: companies are investing in the infrastructure that they need to operate successfully, and our best and brightest are incentivised to stay on the continent. At the same time, as the inspirational Dr. Makhtar Diop, Vice President of the World Bank for Africa, says, these programmes will help our countries gain the highly skilled personnel necessary to enhance productive sectors, and boost our continent’s structural economic transformation. Second, business can help African universities create STEM graduates. For example, they can help cash-strapped faculties design and deliver high quality and industry-relevant STEM curricula. Global heavyweights such as IBM are doing just this with its Africa University Programme, in which 80 universities across the continent participate to enhance their curriculum. These universities provide their final year students with a range of training including business analytics, data management, cloud and mobile technology training via the technical role based model applied in the IBM Technical Academy. Academic staff and students also receive support from IBM’s team of experts and an IBM training and information portal. Such initiatives will help create more resilient higher education institutions that are better able to respond to the needs of industry. Additionally, more African graduates will gain the skills and competences that they need to compete in a highly competitive job market, and help appease the 90% of CEOs on the continent who are concerned about the low availability of key competences. Going forward, we need these types of programmes to be commonplace amongst large and small firms, integrated into our higher education institutions and better aligned with the teaching and research goals. Finally, Global Goal 9 calls on governments and other stakeholders to ‘support domestic technology development, research and innovation’. Considering the financial and technical resources at their disposal, businesses are well equipped to help build capacity in these areas. Company executives can provide mentoring and other assistance for people working in the tech hubs that are producing some of the most exciting innovations to emerge in the region. They can also help young entrepreneurs protect their creations from misappropriation by helping raise awareness of IP rights legislation, something Microsoft’s 4Afrika Initiative is doing through the 4Afrika IP hub. This can help build local human and technical capital, a long-term enabler of economic growth, and boost innovation. Ultimately, stronger infrastructure, sustainable industrialisation and innovation can only be delivered through a commitment to invest in local human capacity, skills and knowledge. That requires collaboration between governments, the private sector and other stakeholders to enhance scientific research, train STEM graduates and enable domestic technology development. But, for businesses, this is an enormous opportunity, given the potential gains to be had from a workforce that can secure Africa’s place as a leader in the global knowledge economy. This entry was posted in Blog, Business, Science by Alvaro Sobrinho. Bookmark the permalink.